Tonya Browning hand-stamps each ceramic plate with an inspiring message for passionate travelers. If our universal language is love, then the best way to communicate must be with treats. Passionate travelers will eat up Tonya Browning's ceramic plate. 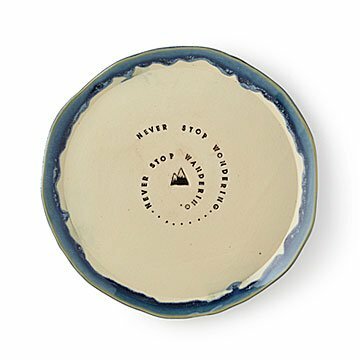 She stamps each one with the inspiring message "Never stop wondering... Never stop wandering," and applies a beautiful blue glaze around the edge. Fill it with Swedish cardamom buns, or maybe Turkish baklava. Remember: "Mmm" works everywhere. Handmade in Charleston, West Virginia. Tonya is a stay-at-home mom of three and a small-batch potter. Originally from Columbus, Ohio with degrees in theatre and art from Ohio University, she is completely self-taught in pottery, from throwing on the wheel to slipcasting, designing, and carving. She works out of her small home studio, designing each piece to be functional while bringing joy and laughter to its owners. Microwave and dishwasher safe. Hand wash recommended. Size is not as listed. The size states 11 inches and its 8. Wanted to use as display plate. Bought 2 versions.